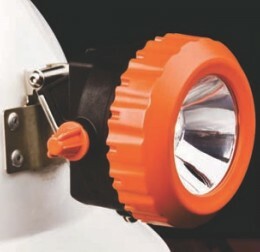 The All In One Cap Lamp is a modern design that delivers superior light levels and the convenience of a cordless system. The energy efficient LED lighting provides a brighter and longer lasting white light. A compact, energy dense lithium polymer battery eliminates the need for a heavy external battery pack and electrical cable. The superior design reduces amount of maintenance required.